Oreos have been getting around lately, showing up in everything from red velvet cupcakes to candied bacon. Now, the cookie is getting even more complex in an Oreo, Nutella, and pretzel "dessert-sandwich". 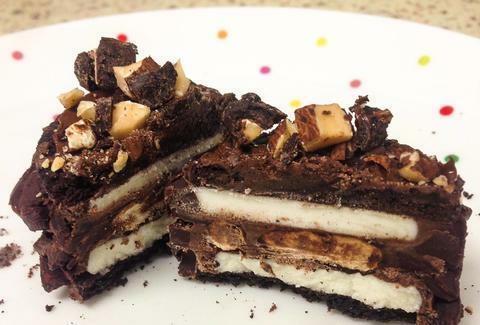 Created by Redditor wulfx, these concoctions require two Oreos apiece. To make them, you crack open each cookie, then toss the cream-less parts aside/into your mouth. Place one Nutella-covered pretzel in between the remaining cream-filled sides like a sandwich, and submerge the whole thing in more Nutella. Roll that gooey mess in some chopped truffles so they stick to the sides. Then add even more Nutella, plus some chopped almonds. Toss it in the freezer, and you've made every frozen Snickers bar you've ever eaten irrelevant. Kristin Hunt is a food/drink staff writer for Thrillist and will donate her life savings to a Nutella-themed lab if it means more snacks like these. Follow her at @kristin_hunt.